Junction of Jenolan Caves Road and Duckmaloi Road (on The Greater Blue Mountains Drive), 4km south of Hampton. A must-do variation off the main Greater Blue Mountains Drive into spectacular escarpment country and Jenolan Caves, with a bonus out-and-back drive deep into Kanangra-Boyd National Park. Overnight stay recommended. The scenery, Kanangra Walls and Jenolan Caves. Very steep and winding road into the Jenolan Valley and back out again. Caravans not allowed. These can be left at Oberon. Enquire at the visitor centre. Kangaroos on the Kanangra Walls Road. Take the sealed Edith Road southwards out of Oberon, across high country farmland and through the village of Edith. After 23km, the unsealed Kanangra Walls Road turns off to the right into Kanangra-Boyd National Park. It traverses the Boyd Plateau's montane forests of snow gum and mountain gum (with signs of past logging) before emerging into mallee and heath on the plateau edge. Boyd River Camping Area is passed some 10km from the turnoff, then the road end and carpark is reached after 28km. A short, easy walk (wheelchair accessible) leads to the majestic main lookout on the brink of Kanangra Deep. Longer walks go to Kalang Falls and out onto the sandstone plateau of Kanangra Tops for even more breathtaking views. 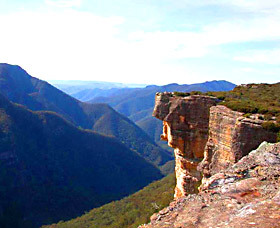 Experienced bushwalkers range far and wide into the Kanangra-Boyd Wilderness. Returning to the Edith Road, it descends very steeply (hairpin bends) down the 'two-mile' hill into the valley of Jenolan Caves. Guided and self-guided tours of the caves are available every day, a network of surface tracks explore the remarkable karst landscape, and Jenolan Caves House provides accommodation, a bistro, café and gift shop. Parking and tour fees apply. When leaving the caves, drive through the Grand Arch (remember to turn off your headlights!) and follow the winding road up the 'five-mile' hill (make sure you stop at Mount Inspiration for the view) and along the plateau to rejoin The Greater Blue Mountains Drive at the Duckmaloi Road junction.